On the face of it, the Odyssey Black iX 1 is a fairly standard Anser style copy putter. The two tone colour scheme makes it look a bit more modern than a regular Ping or Scotty Cameron, but for some reason it didn't appeal. 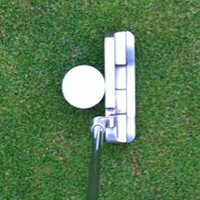 I'm sure you'd get used to the shape, so in the end it wouldn't matter, but I found it didn't have the clean lines of other putters in this price range, and just looked a bit too complicated - too many lines and levels. The aimline is also extremely short, and stretches only halfway from the back of the hitting surface to the flange. You may not find that a problem, but I'm afraid I did. Just like all the putters Odyssey have ever made, the Black's insert face feels great. It's hard to describe, but their inserts seem to me to have the edge over all other insert putters. Another thing I liked about the Black was that it feels relatively light in the toe, giving you the sensation that the blade is stable through impact and not trying to shut too aggressively. The roll was top class. There was no hint of a jump. All round, extremely impressive. Great feel and roll. Only minus points are the unorthodox shape and short aimline.